Does Desert Weather Stop Seasonal Allergies? This is mostly a myth, with an element of truth to it. It used to be fairly common advice for allergy-sufferers to move to the desert. 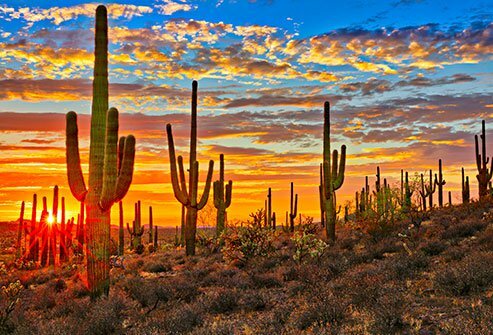 With their hot, dry climates, deserts are free from a lot of the usual suspects that cause seasonal allergies like ragweed and grass. However, apparently everyone listened. Desert communities like Las Vegas and Phoenix now feature many of the same allergenic plants found elsewhere. You still may get some relief in a drier climate, though. More remote desert areas can have lower pollen counts, though some people are allergic to desert plants like sagebrush and Russian thistle. You may get some relief from dust, too. Scientists from North Carolina studied different areas around the U.S. for dust mites, the microscopic pests responsible for many indoor allergies. They found that the Great Plains and Mountain West regions—drier than the coasts—produced fewer dust mites. Do Flower Bouquets Bring Allergies On? It’s a common comic device—a would-be Romeo handing a woman flowers, only to watch her face flush and sneeze. But are flowers to blame when your seasonal allergies hit? Probably not. Most people aren’t allergic to the pollen in flowers. 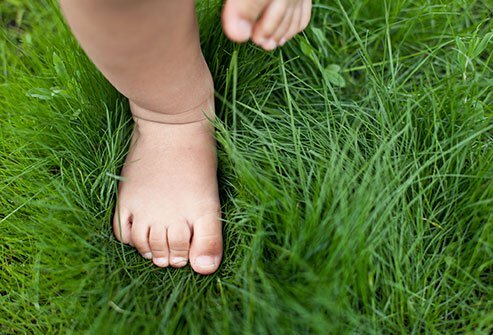 Instead it’s the grasses, weeds, and trees that tend to present allergy problems. Why not flower pollen? As it turns out, flower pollen is relatively heavy. 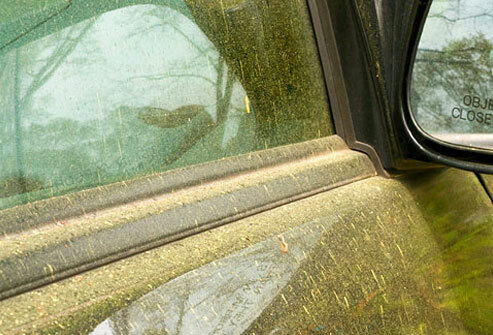 It doesn’t travel as far or as easily as smaller, lighter pollen particles. That’s because flowers are designed to attract bees and other insects, which carry the pollens themselves. Other plants need smaller pollen so the wind can carry it to new locations. Is the Beach a Pollen-Free Zone? If you’re planning on moving to the coast to escape your allergies, think carefully. It’s true that coastal areas often have lower pollen counts than inland places, but they are not pollen-free. If ragweed is the allergen that gives you sneezing fits, you may be disappointed by a coastal trip—ragweed pollen can travel as far as 400 miles across the ocean. You may get more advantage from a coastal trip if you wade into the water. 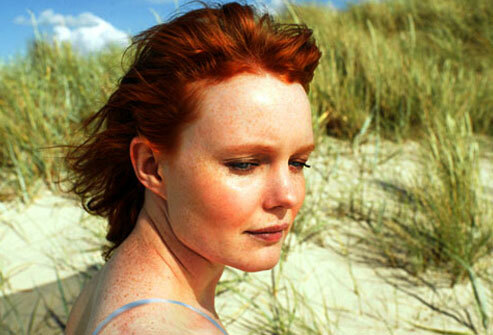 Submerging in seawater helps your nose produce mucus, which is critical if you want to ease your allergy symptoms. Of course you can also stop by a drug store for a saline nasal spray, which helps just as well. Can You Predict Bad Allergy Days? Wouldn’t it be nice to know when your allergies are about to strike? If you want to stay ahead of your allergies, the daily pollen count is an effective tool to help you. Groups like the volunteers of the National Allergy Bureau staff dozens of pollen-counting stations across the U.S. and Canada. Using microscopes, the volunteers count and report the amount of pollen in the air that day. The more pollen, the greater your allergy risk. If you’ll be exposed to the pollen anyway, why bother checking the count? The reason is this: allergy medicine works best if you take it before being exposed to allergens. So a pollen count or forecast can alert you to start taking your medicine, which can hold back the histamine response that causes your sniffling, sneezing, and itching. Can You Treat Allergies by Eating Local Honey? 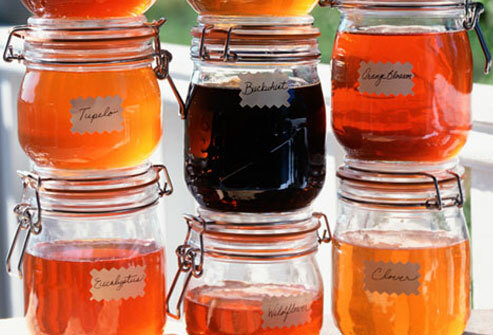 Here’s a sweet treatment: eat locally produced honey to relieve your seasonal allergies. It would be sweet, that is, if it worked. The idea is basically this: bees use pollen to produce honey, and that pollen may come from the same plants you’re allergic to. If it does, you may be able to tolerate the pollen little by little by eating it in your honey. 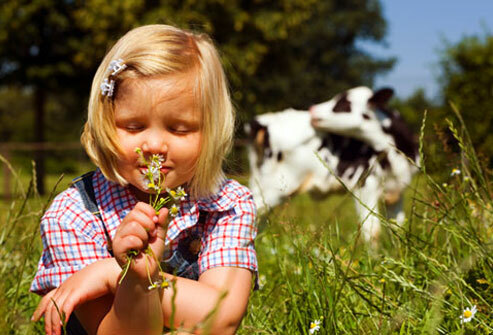 Do Kids Typically Outgrow Their Hay Fever? Kids do sometimes outgrow allergies. A lot of food-related allergies can be outgrown, particularly mild ones, though this varies from person to person. But seasonal allergies usually stick with you for life. Some people find help from immunotherapy in the form of allergy shots or sublingual tablets. That can help you develop a tolerance for a particular allergen. However, once you’ve had an allergic reaction to one thing in your environment (grass pollen, for instance), you tend to develop more. That’s known as the “priming effect.” The priming effect means that once you’ve been primed to react to one allergen, you’re more likely to react to another one. So once you’ve defeated a grass pollen allergy, a mold allergy might crop up next, or a tree pollen allergy. Is Rain Good for Allergies? Some seasonal allergy sufferers celebrate the rain because it relieves their symptoms, while others dread it. Why the difference in attitude? It’s because depending on your allergy, rain can either be a good sign or a bad sign. Let’s start with the good things about rain for allergies. Some pollens scatter and collect on outdoor surfaces, accumulating over time. When steady or heavy rains come, they wash away this accumulation of pollen, and that is good news if those types of pollen give you sneezing fits. What’s more, the moisture in the air can weigh down pollens, sending them down to the ground. With enough rainwater, the pollen then flushes down the drain and away from your sinuses. Of course there’s bad news, too. 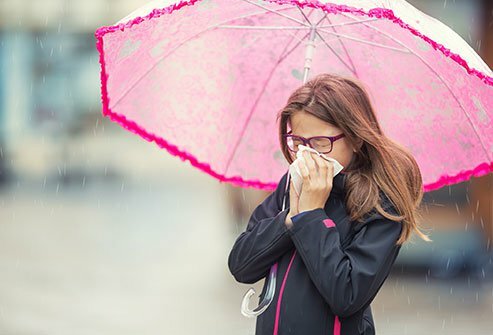 Sometimes when it rains—especially during sudden downpours—the airborne pollens clump together on their way down, then crash apart when they hit the ground, scattering everywhere, and perhaps eventually through your nostrils. There are other problems as well. After enough rain has poured, mold starts to grow, aggravating anyone with mold spore allergies. You may be able to escape somewhat if you reduce the humidity inside your home, which discourages mold. Grasses thrive after the rain too, so grass pollen allergies can also intensify soon after rainfall. Are Mold Allergens Only Indoors? You’ve dehumidified your home. You’ve kept dampness down, fixed leaking pipes, and installed a HEPA air filter in your central air conditioning unit. Your home is officially mold-free. So are your mold allergies gone for good? Not necessarily. Mold spores don’t only affect you inside your home or work. They can also crop up outdoors. If winters are cold enough where you live, mold spores won’t die off like some plants. Instead they become inactive, waiting for warmer weather to spring back into action. Typically by summer or fall these spores are in full swing, making your eyes water and your nose itch. If mold spores aggravate you, try to stay inside when the spore count is high. Yard work and gardening activities like digging up weeds, raking leaves, and mowing the lawn can stir up the plant matter mold thrives on, leaving you exposed. If you have to be outside to do yardwork, wear a mask that keeps out dust--it should work against the spores as well. Does ‘Hay Fever’ Mean You’re Allergic to Hay? Nope. In the early 19th century, a British amateur scientist named John Bostock wrote about his allergic symptoms in detail for the first time. He began to find others with similar problems and studied their cases. He wrote in 1825 about a popular idea at the time: the smell of hay caused seasonal allergies. (Pollen was identified as the culprit about 35 years later). Even Bostock didn’t believe the smell of hay caused these problems. He noticed his symptoms cropped up in the summertime, and called the affliction “summer catarrh” (a catarrh is a buildup of mucus). Clearly that one didn’t catch on. Why “hay fever” has stuck isn’t clear. The term has survived for more than 200 years, though. It’s outlasted other terms, including “rose cold” and “rose fever.” Just like we once thought “hay fever” was caused by the smell of hay, people once believed the smell of roses caused the condition, too. Do Allergies Ever Develop as an Adult? Allergies rarely develop as brand new cases as adults. That’s not to say it never happens, though. However, many adults experience symptoms afresh and wonder how and why. Although you may have developed a fresh new case of allergies, there’s often a different explanation. Allergies seem to go through stages. Many people experience intense allergy symptoms as children and adolescents, only to find that their symptoms recede in young adulthood. Then later in life those allergies tend to roar back to life. 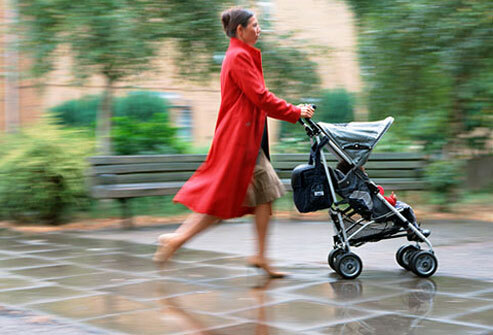 In their 30s, a time when many become parents, allergy sufferers often suffer like they did as kids. Some speculate this has something to do with the colds kids bring home to Mom and Dad, since both colds and allergies influence the immune system. Can You Get a Shot to Prevent Allergies? There is a shot you can take to end or reduce your allergies. The practice is called immunotherapy, and it’s well-established. Doctors have been giving out allergy shots for more than 100 years, in fact. 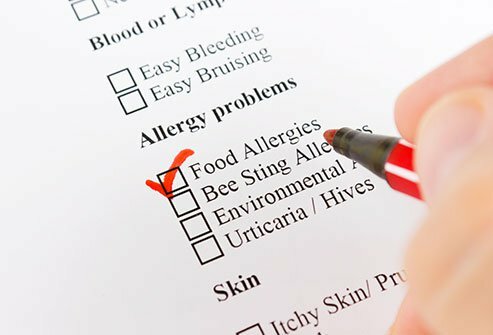 The idea is to slowly introduce an allergen or group of allergens into an allergic person’s body over a long period of time. If done correctly, this usually reduces allergy symptoms significantly and helps reduce the need for allergy medicines as well. Allergy shots take a real commitment on the part of the patient. It’s a 3-5 year process in fact. 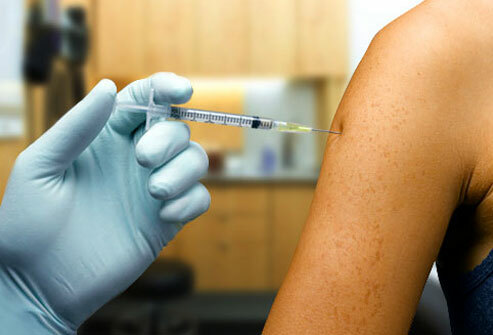 Initially a patient must receive one or two shots a week for about three and a half months. This is called the build-up phase, and sometimes patients opt to receive more shots sooner, which can shorten this phase to about a month. After the build-up phase, allergy shots are given once or twice a month for several years. That’s a lot of visits to the doctor’s office! Recently a new form of immunotherapy has emerged. Sublingual immunotherapy comes in the form of a liquid or tablet you can take at home. The medicine goes underneath your tongue (that’s what sublingual means) once a day. People tend to like the convenience of this at-home therapy, but it has some drawbacks too. For one, studies suggest it may not be quite as effective as the shots. It’s also less likely to help if you have multiple allergies. An immunologist can help you decide on the most effective treatment. Have Seasonal Allergies Ever Been Fashionable? Believe it or not, seasonal allergies were once a fashionable fad. How could sneezing, itching, and runny noses be trendy? It all comes down to peoples’ perceptions. Around the end of the 1800s, people thought of allergies as a disease of the upper classes. It seemed to impact people in the city more than the countryside. This association led observers to believe that education, wealth, and refinement were all linked to hay fever. Certain professions, especially those in the fields of medicine and theology, were thought to lead to allergies. Associations of hay fever sufferers sprang up, their members proud to be associated with this “aristocratic disease.” They even acquired a nickname: “Hayfeverites.” The association between allergy and aristocracy lasted well into the 20th century. A popular play produced in 1924, “Hay Fever,” lampooned the upper classes. It wasn’t until the 1930s that allergists began to suspect anyone could acquire allergies. It’s easy today to see how strange and silly these ideas are. But the basic observation that urbanites are more threatened with allergies than those living in the countryside could be true. 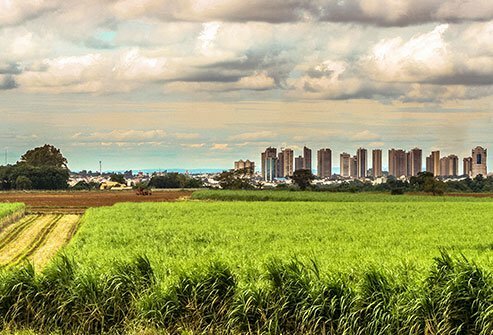 Today people often develop allergies after moving from rural areas to cities. However, the reason may be more straightforward: urban areas often have pollution, and pollution can set off allergies. What’s more, growing up around farm conditions could prevent allergies in some. Can Being Dirty Protect You? Does growing up in a dirtier environment protect you from allergies? Possibly. To understand this, we have to look at the early stages of human development. A newborn baby’s immune system is like a new computer without many files on it. It needs germs from the environment to help fill its “hard drive” with information teaching it what harmful pathogens it needs to protect itself from. Very clean homes like those typically found in the U.S. have fewer germs and, so the theory goes, fail to educate a developing child’s immune response. When the baby’s immune system doesn’t get enough “data” from germs, it starts to “learn” from what is available—pollen, dust mites, and other common allergens. But wait—if you expose your child to germs, doesn’t that expose your child to illnesses too? The answer is it depends on the germs. Dangerous, disease-causing germs like the ones that spread measles aren’t the only kind that can “teach” an immune system what organisms it can safely tolerate. There are lots of other, less harmful germs out there. 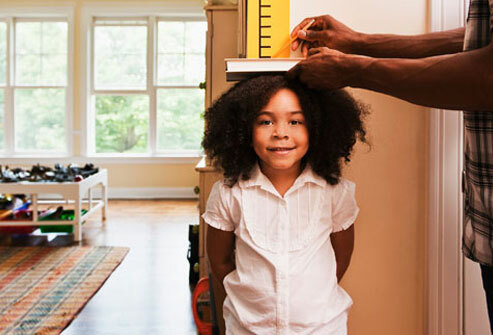 Studies show children from larger families are safer from allergies, and so are kids with pets in the family. Contact with other people and animals in the first few months of life may be the safest way to protect your child from developing allergies. Is Allergy Season Getting Longer? Does it seem like your allergies are getting worse? If you’ve noticed more sniffling and sneezing in the off-season, you’re not alone. The allergy season is growing longer. 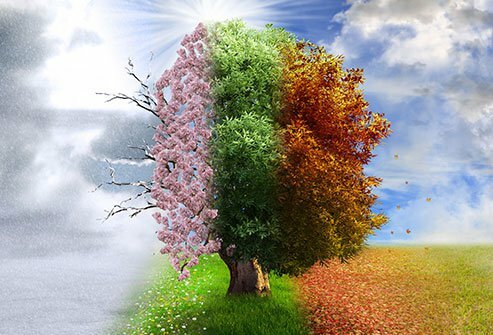 For 16 years, the allergy season has lasted 11 days to a month longer. Why? The answer seems to be warmer temperatures. With warmer than usual temperatures, pollen can be found in the air longer. Higher levels of CO2 in our atmosphere also help plants grow more quickly and easily, causing them to produce pollen more intensely, too. Warmer weather also worsens pollution, which can aggravate allergies and asthma. Can Thunderstorms Make Allergies Worse? A good, steady downpour can be helpful for those suffering from nasal allergies. Big droplets of rain clean pollen from the air, and with enough water those pollens soon drain away. So a thunderstorm should be helpful too, right? Not so fast! Thunderstorms can actually make allergies worse. Hospital records suggest asthma outbreaks are more common following thunderstorms. One study found that asthma visits to emergency rooms increased by 3 percent in the 24 hours after a thunderstorm. Why? Although it’s still debated, the main theory is that thunderstorms rupture pollen grains near the ground, causing them to spread and release back into the atmosphere. Evidence suggests the first 20-30 minutes of a thunderstorm are the worst for those with allergic rhinitis. Even allergy-sufferers who aren’t usually prone to asthma are at more risk of developing asthma during these storms. One research group advises anyone with allergies to avoid going out in a thunderstorm. If you’re stuck outside when one hits, they suggest covering your face with a cloth to keep pollen out of your airways. Can Seasonal Allergies Give You Food Allergies Too? OAS can be extremely frustrating, as a person can often go for a long time—years in fact—without reacting to one of these foods. Why do seasonal allergies sometimes cause food allergies? It turns out certain food proteins resemble allergenic pollens. It only happens in raw fruits, vegetables, and some tree nuts—cooking the food changes its proteins and makes it harmless. 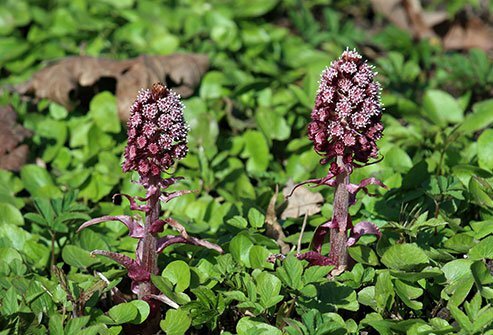 Can Butterbur Extract Improve Allergy Symptoms? Butterbur is a plant related to the sunflower that produces a pinkish purple flower. Some suspect the plant’s active ingredient, petasin, may act as an antihistamine, a chemical that eases the effects of allergenic substances. The question is: does butterbur work? It’s hard to say. Some evidence seems to suggest it does. Other studies show no difference from placebo. If you decide you want to try it though, you need to be careful for two reasons. First, raw butterbur herb extract contains toxic alkaloids that can cause cancer and liver damage, so be careful when purchasing. Second, some people are actually allergic to butterbur itself, especially people with ragweed allergies. Does PMS Make Allergy Symptoms Worse? PMS aggravates so many other aspects of your health, so much so that more than 100 symptoms have been attributed to this monthly discomfort. Now you can add allergies to the list as well. As children, more boys have allergies than girls. However after puberty, that reverses. 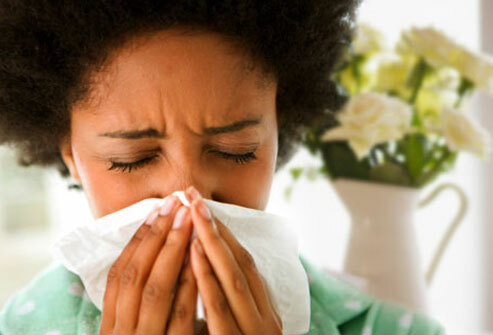 Women are not only more likely to get allergies, but their symptoms are more severe than men. This has led scientists to look more closely at estrogen and progesterone, two hormones that seem to play a role in allergic reactions. Estrogen has a complex relationship to allergies, and its exact role is still being studied. One thing seems to be clear, though: PMS worsens allergies. Do Allergies Get Better Around the Time You Retire? As you get past age 65, your immune system begins to decline. That has negative consequences but the silver lining for allergy sufferers is that your sniffling may go away. People between the ages of 18 and 60 have a higher frequency of nasal allergies than older adults. “Fewer” allergies doesn’t mean “no” allergies, though. 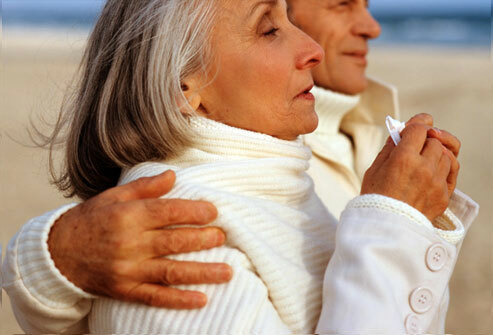 An estimated 13% to 15% of older adults still get seasonal allergies. For those seniors who still get them, symptoms can be more serious. 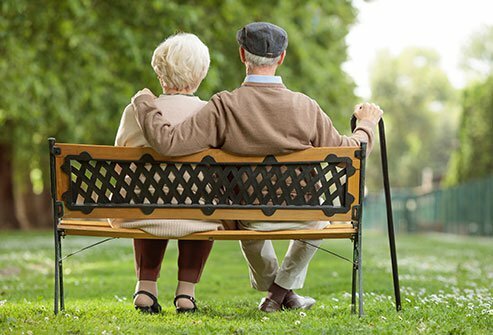 Medical costs, quality of life issues, and hospitalizations from allergies are more common later in life.